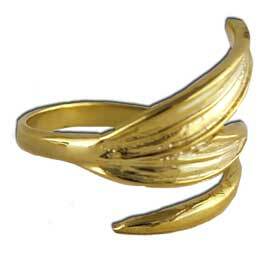 This 24k gold plated sterling silver ring features olive leaves. Inspired by the Greek olive tree leaves, part of the most symbolic tree in nature. In Ancient Greece, the Olive tree leaf was a symbol of abundance, glory and peace. As emblems of benediction and purification, olive leaves were also ritually offered to deities and powerful figures. In the Olympic Games, the prize for victory was an olive leaf crown. In the Bible, the olive tree is the first tree mentioned in both testaments and it was an olive leaf that a dove brought back to Noah to demonstrate that the flood was over. In the Quran, prophet Mohamed said: "Take oil of olive and massage with it - it is a blessed tree." Ring is fully adjustable but we offer it in two sizes: Small (ring sizes 4-7) and Large (ring sizes 7.5- 9.5) Let us know which one you prefer in the "Special Instructions" during ordering.